This is our permanent page for IHG PointBreaks promotions. You can bookmark this permanent page for the IHG PointBreaks list which will be updated regularly with the most recent offers. So be sure to subscribe to our newsletter so you don’t miss the next one. 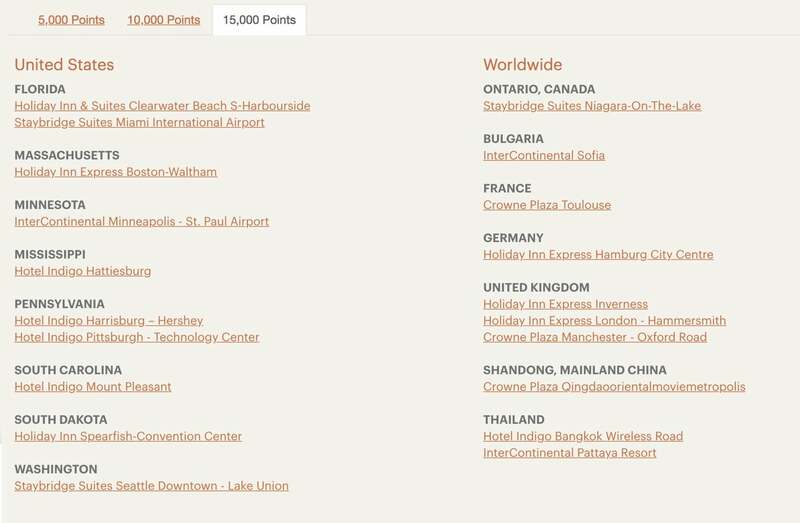 The new IHG PointBreaks list is up! You can book discounted hotels through May 31, 2019. With IHG PointBreaks, you can book certain IHG hotels around the world at a discounted rate of either 5,000, 10,000, or 15,000 IHG points per night. And you can also use the IHG Points & Cash trick to “buy” IHG points for as little as ~0.6 cents each. So you’ll be able to book hotels on the list for between ~$30 and ~$90 per night. What’s great about discounted IHG award nights is that it’s easy to earn lots of IHG points for stays like this from cards like the IHG® Rewards Club Premier Credit Card. The PointBreaks promotion used to be one of the better on going hotel promotions. Jason even booked a posh Intercontinental Residences apartment for only 5,000 IHG points a night during a past promotion. But IHG has slowly squeezed the life out of these discounts. It’s hard not to be disappointed. 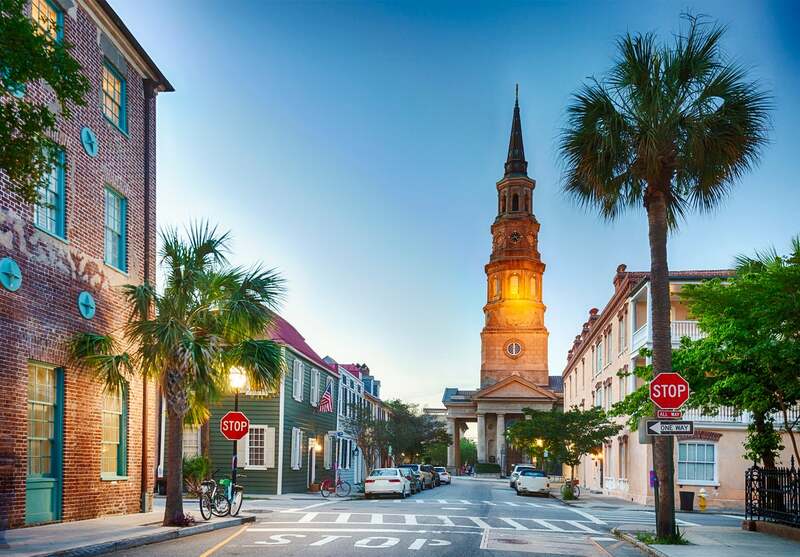 Even though this promotion isn’t what it used to be, there are some great deals to be had if they fit your travel plans. So instead of comparing it to what it once was, look at it for what it is. And hopefully there is something on the list that fits your travel plans. It’s best to book a PointBreaks stay as soon as possible if you think you’ll use it because the best hotels will sell out MUCH faster at this discounted rate. You can always cancel later and get your IHG points back if you change your mind. Just always remember do the math to make sure it’s a good deal before you book because some of these hotels have cheaper cash rates this time of year. But even so, it’s harder to get a bad deal when you’re only paying 5,000 to 15,000 IHG points a night! You’re allowed to book 2 stays per hotel and the stay length is not limited. You can quickly rack up IHG points by opening the IHG® Rewards Club Premier Credit Card. With it, you can earn 80,000 IHG points after spending $2,000 on purchases within the first 3 months of account opening. 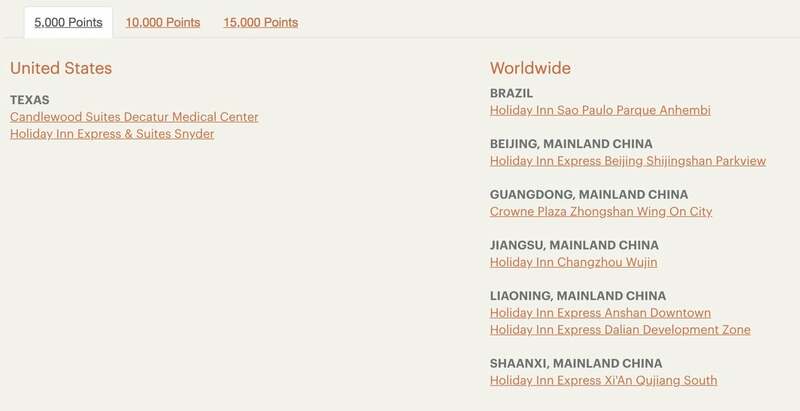 Plus, an additional 40,000 IHG points after spending $5,000 total in the first six months. You can also transfer Chase Ultimate Rewards points to IHG at a 1:1 ratio, but I don’t recommend this. Because there are much better transfer partners that will give you exponentially more value for your points, like United Airlines and Hyatt. 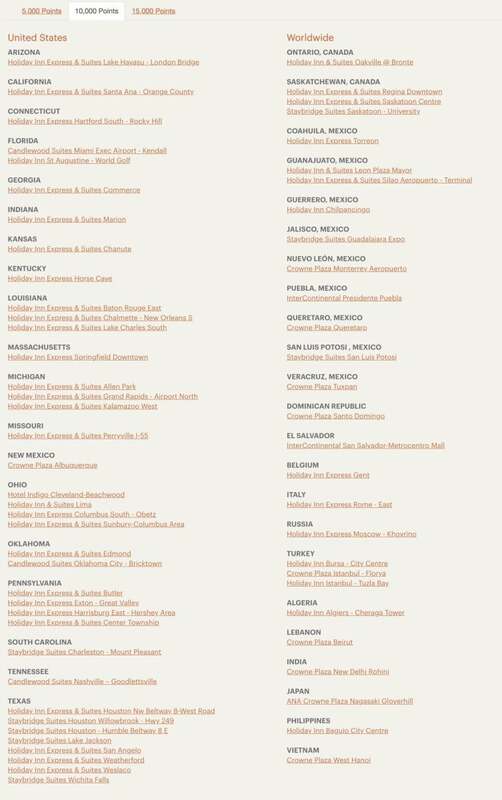 If you end up booking any of this round’s PointBreaks hotels, share your travel plans in the comments! You can view all the hotels and book discounted nights here. I don’t know where did you got that list, but https://www.ihg.com/rewardsclub/content/us/en/redeem-rewards/pointbreaks shows much less hotels. For example I don’t see Crown Plaza in Santo Domingo, Dominican Republic listed as 10,000 point deal. Was disappointed that two days into this many of the even 15k point rooms that fit our plans were gone. Guess I should be quicker on the draw!!! Thank you all for this. I just made a reservation for an upcoming road trip in a couple of weeks. That is combined with the VISA Signature hotel stays you told us about a while back. Just like my last vacation you are helping make this one much more affordable as well! I love hearing about your successes! Thanks for sharing them and I wish you a wonderful trip!